After investing heavily in him this past summer, big things are expected of Barcelona midfielder Arthur moving forward, and he’s showing exactly why. As noted by Sky Sports, the Brazilian starlet was signed in a deal worth €40m this past summer, with the 22-year-old expected to be a long-term solution in midfield for the Catalan giants. It’s been a slow start in general to life in Spain as he’s been eased into the line-up by coach Ernesto Valverde, making nine appearances in all competitions, although he hasn’t quite nailed down a spot in the starting XI on a regular basis. 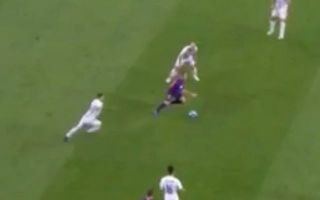 If he continues to produce performances like the one seen against Inter in the Champions League on Wednesday night, it’s hard to see that lasting much longer as he produced some really classy bits of play, as seen in the video below. From his close control to his composure and patience in possession to his ability to pick out the simple but effective passes, it was strangely reminiscent of Barcelona legend Xavi, with the pair ultimately playing in a very similar role for the reigning Spanish champions. As noted in the tweets below, many Barcelona fans also noticed the striking similarity, and so they’ll be hoping that the talented young midfielder can continue in this vein moving forward. While he will likely never be able to fill the void left behind by club icon Xavi, he certainly looks capable of replicating the job that he did for the team. one day, maestro Xavi will coach this boy. ?? Now we need Frenkie De Jong to link up with this guy.Reborn or Xavi and Iniesta.